Cocktails and Confections for Icing Smiles. There are a limited number of reserved tables so book early! Help us treat a medical family to a night out. 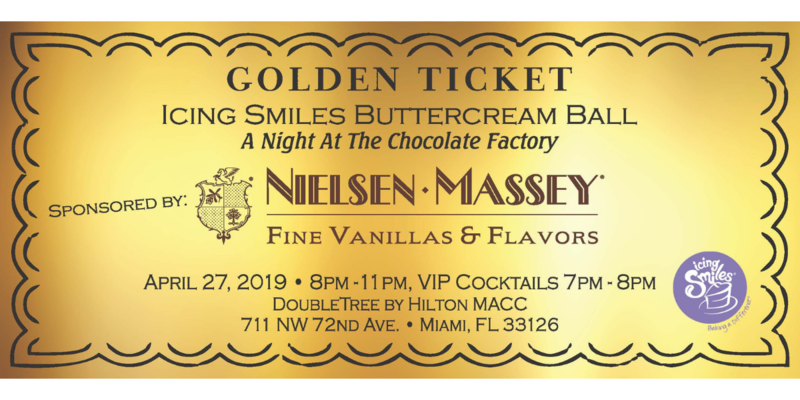 Chase away the winter blues and join Icing Smiles for the 2019 Nielsen-Massey Buttercream Ball at the Miami DoubleTree by Hilton—MACC, between South Beach and downtown Miami! This casually elegant evening will entertain everyone with music and dancing, incredible catering, and of course our silent auction with something for everyone... restaurant gift cards, autographed memorabilia, and those special items you just can't buy. Creativity will take center stage during our LIVE Domino Sugar "Showpiece Showdown" cake competition. Three of the industry's top Sugar Artists will partner with an Icing Smiles Super Hero child to compete head-to-head for the crowd. Last year's winners will return to defend their title. The showdown brings the magic of our mission to life! We are dependent on sponsors to make this event a success! For information contact events@icingsmiles.org or visit our EVENT SPONSORSHIP PAGE! So grab your favorite party clothes and join us on for a night of fun from 8pm-11pm! We promise it's going to be a night you won't want to miss! **The event officially starts at 8pm, but if you would like to share a cocktail and your Icing Smiles experience with out Smile Squad, you are welcome to join us for a pre-event cocktail hour at 7pm!